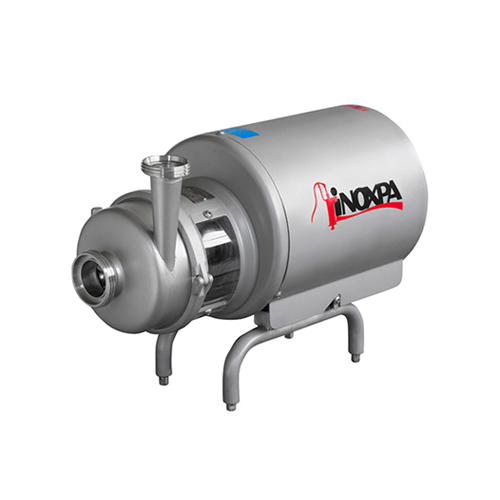 Due to the choice of materials and its design, hygienic centrifugal pump PROLAC HCP is appropriate for applications requiring a high level of hygiene, gentle handling of the product and resistance to chemical agents. 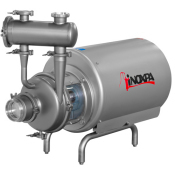 This centrifugal pump is particularly suitable as main process pump in the dairy, beverage, pharmaceutical and cosmetic industries. 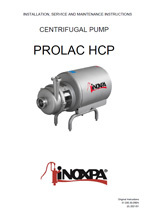 PROLAC HCP is a range of close-coupled centrifugal pumps with hygienic design, compact and highly efficient. 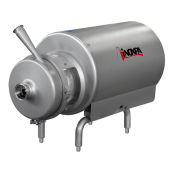 It is made of a cold-formed stainless steel casing, impeller, mechanical seal, pump cover, lantern and shaft, connected to the motor shaft by mechanical compression. 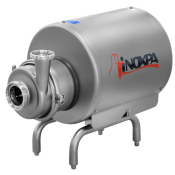 The pump is EHEDG certified, it is especially designed for CIP/SIP without disassembly. 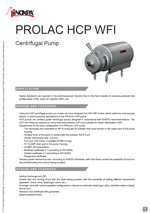 The PROLAC HCP centrifugal pump is provided with an internal single mechanical seal. The seal is balanced and has a hygienic design. As standard, the stationary part is in carbon and the rotary part is in silicon carbide, the gaskets are in EPDM. However, when required, other material can be used. There is also an option of assembly of a double mechanical seal made of two identical seals. 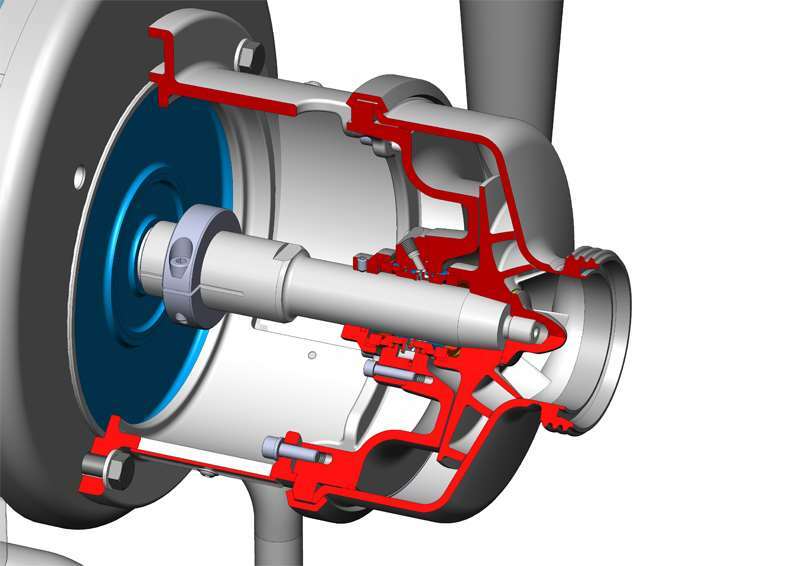 It helps to upgrade a pump with single seal to double seal and simplifies the mangement of necessary spare parts as the seal is the same. Pump casing with heating chamber. Mechanical seal: SiC/SiC or TuC/SiC. 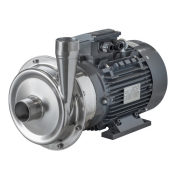 Motor with other voltages, frequencies, mechanical protections, efficiencies. 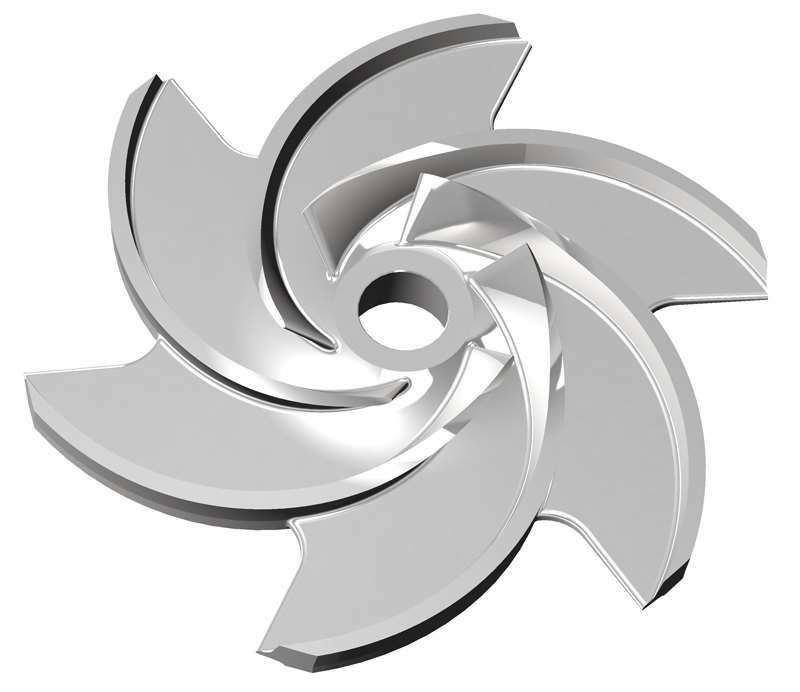 Mechanical seal materials: C/SiC and SiC/SiC. Summary Por su selección de materiales y diseño la PROLAC HCP, certificada EHEDG, es adecuada en aplicaciones donde se requiera un alto nivel de higiene, un trato delicado del producto y resistencia química. 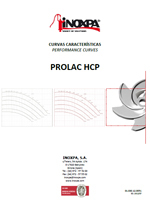 Summary Due to the choice of materials and its design, PROLAC HCP is appropriate for applications requiring a high level of hygiene, gentle handling of the product and resistance to chemical agents. Summary Per la selezione dei materiali e il disegno la PROLAC HCP è adeguata per applicazioni dove si richieda un alto livello di igiene, un trattamento delicato del prodotto e una resistenza chimica. Summary Принимая в внимание конструкцию и материалы исполнения, центробежный насос PROLAC HCP является оптимальным насосом для процессов, требующих высокого уровня гигиены, деликатного обращения с продуктами и стойкости к химическим реагентам. Summary Tomando como base las bombas centrífugas HCP se ha creado la opción HCP-WFI, que añade a la Prolac HCP las opciones más utilizadas en las aplicaciones farmacéuticas. 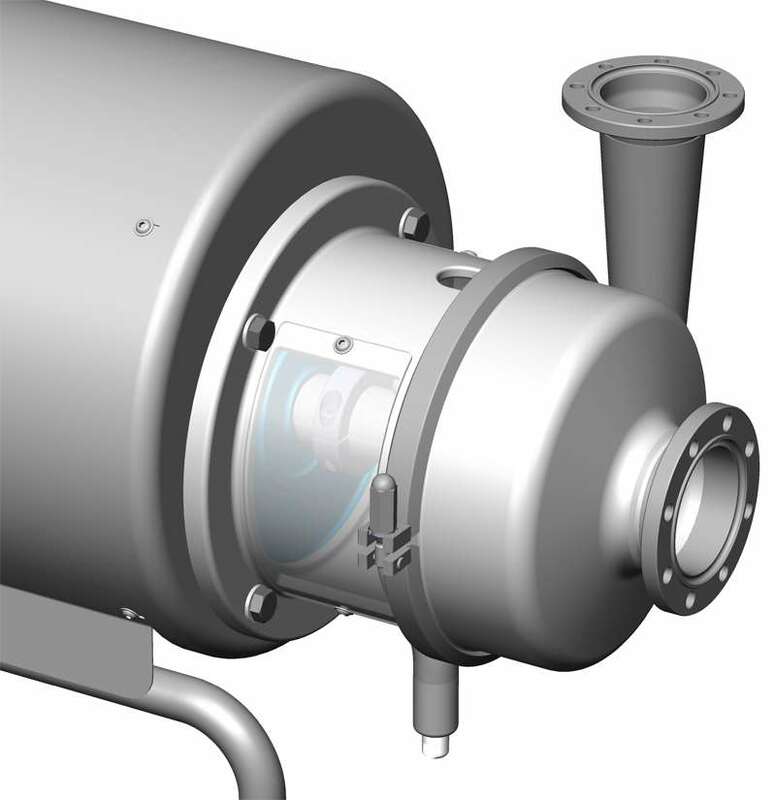 Summary Using the HCP centrifugal pumps as a base, we have designed the HCP-WFI model, which adds the most popular options in pharmaceutical applications to the Prolac HCP pump. Summary La version HCP-WFI a été créée à partirdes pompes centrifuges HCP et apporte à la Prolac HCP-WFI, les options les plus demandées dans les applications pharmaceutiques. Summary Partendo dalla base delle pompe centrifughe sanitarie Prolac HCP, è stata creata la variante HCP-WFI, che aggiunge alla pompa centrifuga Prolac HCP le opzioni più utilizzate nelle applicazioni farmaceutiche. Summary На основе центробежных насосов HCP разработана версия HCP-WFI c опциями, наиболее часто использующимися в фармацевтическом производстве. Summary Este manual contiene información sobre la recepción, instalación, operación, montaje, desmontaje y mantenimiento para la bomba PROLAC HCP. 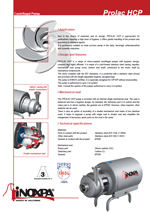 Summary This manual contains information regarding the reception, installation, operation, assembly, disassembly and maintenance of the PROLAC HCP pump. Summary Ce manuel contient des informations sur la réception, l'installation, l'utilisation, le montage, le démontage et l'entretien de la pompe PROLAC HCP. Summary Il presente manuale contiene informazioni sul ricevimento, l'installazione, il funzionamento, il montaggio, lo smontaggio e la manutenzione della pompa PROLAC HCP. Summary A PROLAC HCP é uma bomba centrífuga monobloco de conceção higiénica adequada para ser usada na indústria láctea, de bebidas e alimentar em geral. Summary Diese Bedienungsanleitung enthält Informationen über Empfang, Installation, Betrieb, Zusammenbau, Zerlegung und Wartung der Pumpe PROLAC HCP. Summary PROLAC HCP – это семейство центробежных насосов с гигиеническим дизайном, подходящих для использования в производстве молочных продуктов, напитков и прочих областях пищевой промышленности.